This is a photograph that I shot during last Sunday’s architectural history and photography tour in Cismigiu area of Bucharest. It is an ample bas-relief panel of about 1.2 x 1.6 m containing a theme that makes allusion to ancient Egyptian symbolisms. It adorns the top of the staircase tower of a streamline Art Deco style building designed by the architect Georges Cristinel in the second part of the 1930s. The panel probably depicts a vigorous and vitalist looking family at work (a reference to the “pure” and hard working Romanian family): father, mother and son (the personage with the ancient Egyptian style wig from the lower part). They are engaged in something that looks like building work on a pharaonic scale (signifying the engineering of a highly civilized nation, just as the old Egyptians were), blessed by sunrays bursting from the panel’s upper left hand corner. The three personages, their number is probably another reference to the ancient Egyptian symbolism, namely to the rule of three, characteristic of the Art Deco style, wear cloth in the “Pharaoh” manner, loosely trimmed around their waist. In my opinion this panel, through its hints at racial and civilizational purity, is a “Work and Joy” theme, a late 1930s fascist propaganda programme promoted by the Romanian authorities of that era, inspired from similar developments taking place in Nazi Germany or Fascist Italy, countries with political regimes that by then, in the immediate years before the Second World War, had a huge and unsavoury influence over Romania. 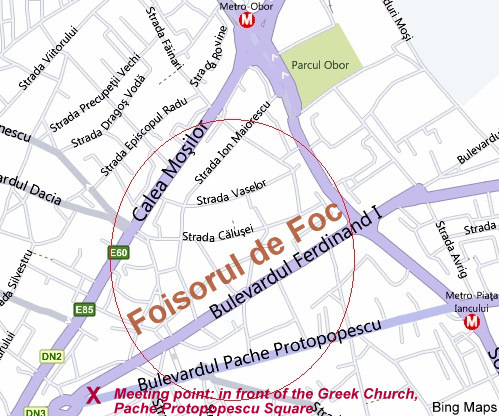 The next Sunday (3 July ’11, 9am-12.00) architectural history and photography tour will take place inFoisorul de Foc (Fire Watchtower) quarter, east-central Bucharest (see a map at this link); meeting point: in front of the Greek Church (the one like an ancient Greek temple from Pache Protopopescu square). I look forward to seeing you there!